HENRY CLINTON. 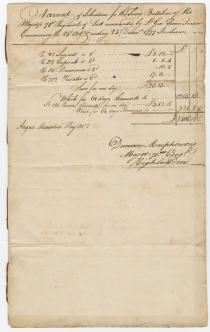 Partially Printed Document Signed, July 13, 1778, Pay warrant for Simon Fraser’s regiment. 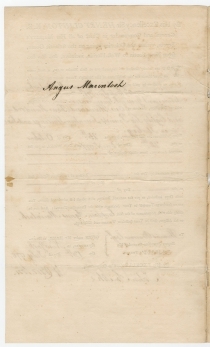 Warrant to Captain Angus Macintosh, who also signs it to acknowledge payment. Bound by a cord, partially disbound and separated, 7¾ x 12½ in. The first leaf is slightly smaller at 7¼ x 12 in. 8 pp. Lieutenant-General Simon Fraser raised the 71st Regiment of Foot (known unofficially as Fraser’s Highlanders) in Inverness, Stirling, and Glasgow in 1775, for service in the American Revolutionary War. The regiment arrived in New York City in July 1776, and helped seize the city in August. It participated in the battles of Fort Washington and Fort Lee in November 1776, and in 1777 fought in the Philadelphia campaign, including the Battle of Brandywine. This warrant for payment of the 71st Regiment of Foot covers their service just after that, from October 25 to December 24, 1777. During that period a detachment supported General John Burgoyne’s foray up the Hudson River. The remainder garrisoned New York City. 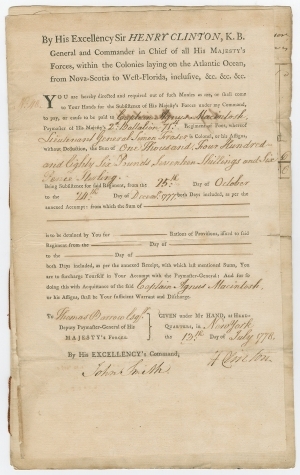 The warrant directs Deputy Paymaster-General Thomas Barrow to pay the money to Captain Angus Macintosh for the payment of 32 sergeants, 32 corporals, 16 drummers, and 702 privates for 61 days and an additional 145 recruits for 61 days. It is counter signed by John Smith. Captain Angus Macintosh signed the reverse to acknowledge receipt of the funds. The Fraser Highlanders wore Black Watch tartan trousers with a cartridge box around the stomach, and elaborate feathered caps. Officers wore Black Watch tartan kilts. The regiment moved to the southern colonies and participated in the capture of Savannah in December 1778 and the successful siege of Charleston in March 1780. They also took part in the battles of Camden (August 1780), Cowpens (January 1781), Guilford Court House (March 1781), and the Siege of Yorktown (September 1781). The regiment disbanded in Scotland in 1786. Henry Clinton (1730-1795) was the son of Admiral George Clinton, governor of the province of New York from 1741 to 1753. The admiral obtained a captain’s commission for his son in 1746, and the younger Clinton served garrison duty in Nova Scotia before returning to Great Britain to pursue his military career. He served in the 1st Foot Guards during the Seven Years War in Europe. Promoted to major general in 1772, Clinton also obtained a seat in Parliament that same year and held it until 1784. In May 1775, he continued his military service in Boston. He participated in the unsuccessful assault on Charleston in June 1776, and the siege of New York City in August. In 1777, he returned to England from January to July, unsuccessfully seeking command of the northern campaign from Montreal to Albany. After General Howe resigned, Clinton served as the British Commander-in-Chief in North America from February 1778 to 1782. He was reelected to Parliament in 1790, and in 1794, appointed Governor of Gibraltar, but he died before assuming office. Angus Macintosh was from Inverness. By 1791, he had settled with his family on the St. John’s river in New Brunswick. “By His Excellency Sir HENRY CLINTON, K.B. General and Commander in Chief of all His Majesty’s Forces, within the Colonies laying on the Atlantic Ocean, from Nova-Scotia to West-Florida, inclusive, &c. &c. &c.
Toned, slightly grubby and with handling marks. Samuel Moss, acquired in 1959.